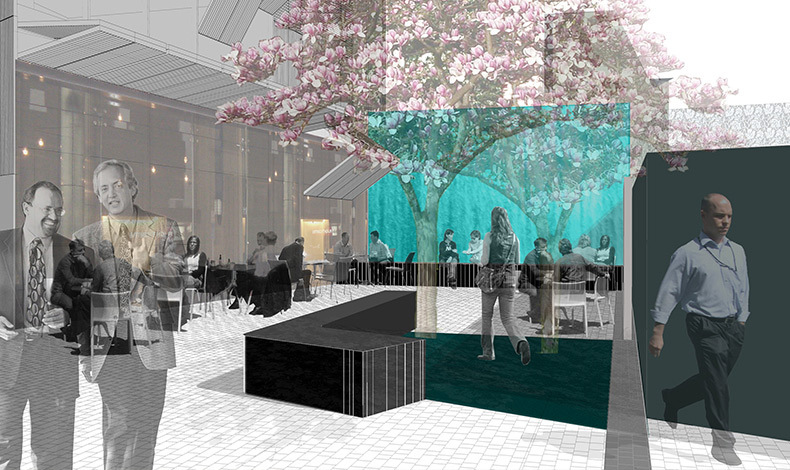 Can you create an alternative retail experience in an established successful neighbourhood? 130 Ponsonby Road is a comprehensive redevelopment of a high profile corner site on Auckland’s Ponsonby Road. It will include a mixed use development of ground floor retail fronting both Ponsonby Road and Mackelvie Street with upper level office space. Buildings are arranged to create a central courtyard accessed via an alleyway from Ponsonby Road and a laneway connecting Mackelvie Street through to Richmond Road via the neighbouring site at 134 Ponsonby Road. The development masterplan furthers the growing network of secondary laneways west of Ponsonby Road offering an alternative retail destination. The internal lane and courtyard network has been designed with a simple palette of stone, steel and water, referencing the former mechanics workshop and garage of the site. The lanes and courtyard offer a more intimate and calm environment in which to spend time in contrast to busy vehicle dominated Ponsonby Road. Landscape concept design and urban design analysis and assessment in preparation for resource consent.